In case of a high probability of rain indicated by weather forecast (Catalonia’s Meteorological Service) participants must compulsory wear a waterproof and breathable jacket, Gore-Tex, Membrain, H2O, YVENT type or similar instead of the required windproof jacket. The race has 11 provisioning points set up along the route, in addition to the existing one at the Starting/Arriving line. The maximum time to complete it is 24 hours. It is compulsory to have a medical certificate of physical aptitude for resistance events accredited by a doctor collegiate in sports medicine, done less than a year before the race. Non-having this document will suppose the disqualification of the runner although has paid the inscription. Only one person will be considered as external assistance and will be controlled by the aid station responsible. The helping area will be located next to the aid station, any other location won’t be allowed. 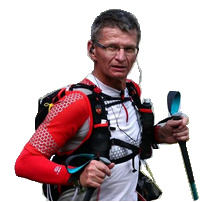 The participant will be disqualified if receives external assistance at any other aid station.